Kafranbel is a liberated town in Syria, i.e not under the influence of the regime. The town became famous for making banners and sharing them on Facebook in support of the revolution. In our liberal age, the notion of freedom is sacred. Arguing the opposite amounts to liberal heresy. The so-called ‘Arab Spring’ as depicted by the media affirms the universal sanctity of freedom. Didn’t “Arabs” sacrifice their lives for freedom’s sake after all? Maybe. The media did not depict the illiberal version of the story. In Syria––as Facebook, YouTube and Twitter remind me everyday – part of the population hates freedom. Is it possible for ‘rational’ human beings to hate freedom? An easy way out is to say that these Syrians are simply nonsensical. They are nonsensical insofar as they do not participate in the gradual, rational, and necessary expansion of a democratic and freedom-loving world. In one of the most celebrated works on democracy, namely Democracy in America (France, 1805-1859), Alexis de Tocqueville declares that democracy is “inevitable”. Scholars of the Middle East have neglected this claim. For the past two decades, academic literature on the region has been occupied with accounting for the immunity of the Middle East towards “Third Wave Democracy”. Samuel Huntington (USA, 1927-2008) identified the democratic transition sweeping Latin America, parts of Asia, and Eastern Europe in the 70’s and 80’s as the third wave of democratization in history. The wave passed the Arab Middle-East. The region defied the historical progression insofar as Arab regimes remained undemocratic and oppressive towards their population. Hence, terms like “smart authoritarianism”, “upgraded authoritarianism”, and “semi-democratization” have prevailed to describe the different Arab regimes and justify their permanence. The introduction of neoliberal economic policies and the artificial opening-up of the political space in the 80’s onward made the resistance to democracy understandable and the possibility for a revolution slight. Hence the “surprise” of the Arab Spring undermined these views and reinforced the belief that democracy and freedom are necessary even if late-coming. The world was impressed and bowed to the struggle. Although this would make for a happy ending, the story is unfortunately not over. In Syria, part of the population developed a bizarre form of hatred in the early months of the “revolution” – if it is plausible to classify it as such. This hatred emerged on the side of the regime’s supporters. Instead of hating authoritarianism and oppression, these Syrians hated that universally most sacred notion of freedom. A vulgar YouTube song with a title which could be transliterated as “*uck you Freedom” was made during the first year of the Syrian turmoil. The song equates revolutionaries demanding freedom to corruptors, traitors, terrorists, Zionists, and religious heretics. A Facebook post ironically entitled “Thank you Freedom” attracted hundreds of likes and shares. The post compares the prices of goods in 2011 and 2013 emphasizing the radical increase of prices during the two years of the conflict and suggesting that “Freedom” is the reason behind that inflation. In one reply to the same post, a Facebook user curses freedom and asks God to bring back the good old “days of dictatorship”. A Tweet quotes the testimony of an eyewitness in al-Houla massacre committed by regime militias in 2012 resulting in casualties, most of which children. In response to the following question: “who committed the killings?”, the eyewitness replies: “some guys came in and said they wanted freedom and then proceeded to slaughter the kids”. The “eyewitness” was giving an interview to the Syrian National TV sponsored by the regime – which could explain his rather unconvincing statement. Undoubtedly, the facticity of all these previous examples should be taken with a grain of salt. However, even if hyperbolic, they are still indicative of a certain sentiment towards the revolution and what it is intimately identified with. The revolution, as many revolutionaries thought of it, was that of Freedom. No anti-regime manifestation would pass by without screaming the word freedom so aloud in the famous slogan as translated from Arabic “Syria wants Freedom”. Once the revolution was blamed for the instigation of a new reality of instability, economic hardship, armed conflict and violence, freedom too was to be blamed. As the identity and language of the revolution, freedom via regime supporters lost its character; no longer sacred, its universality no longer a given. Instead, freedom was associated with all the negative externalities of the revolution and hence became an object of resentment and hate. Hating freedom however means nothing even when expressed so blatantly. It is perhaps possible to hate freedom as much as to have a passion for it. Without an agreement on what freedom implies, it is difficult to diagnose the different sentiments towards it. And here comes the tricky part of the story, What is freedom ? Much appreciated, yet so abstract and amorphous. What does it mean? In satirical fashion, the regime too questions the meaning of freedom. Regime militias have the reputation of provoking revolutionary detainees under torture by asking them: “Is this the freedom that you want?”. Independently from the horrendous context in which this question is often asked, I find it to be a critical one. In a revolutionary context where ideas, values and historical visions are in a conflicting and permanently oscillating state, unintelligible notions like freedom become even more diluted in relation to its conventional meaning. 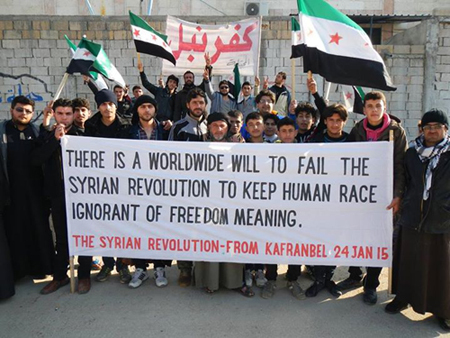 According to the banner in the photograph, the whole world is ignorant of freedom’s meaning and not only the Syrians who “hate” it. Until the “WORLDWIDE WILL” – whose existence I highly doubt – ceases its conspiratorial activity, I say it is time to think freedom. To do so, it might be helpful to forget that freedom is the source of humanity’s worth, and hence its object of love and veneration. If forgotten, the hatred of freedom would then be possible. And in this strange possibility a new interpretation of its meaning and practice would not only be conceivable but may even become necessary. With this tentative finale I invite you to share your thoughts. If you have reflections of any sort on the topic, you could leave a comment below. I find the postivie / negative freedom distinction still amongst the most useful ones (or Constant’s freedoms of the ancients / moderns, roughly). Revolutions intend primarily to break up structures and hence promoting a kind of negative freedom only, and such freedom usually ends in terror. Hence, it seems plausible to me that any notion of freedom as purely negative freedom is deficient, and, given the consequences, perhaps sometimes a “legitimate” target of hatred. However, not all forms of liberalism are committed to such a deficient understanding of freedom, right? Huge differences between libertarian anarchists and egalitarian social democrats, for example. And even those who balance the liberties better in theory, do sometimes differ in practice, I guess. The right ideals, don’t always guarantee peace and happiness, perhaps. Does the question then become which tragedies can be ascribed to bad theory and which ones to bad implementation? Hey David, thanks for sharing your thoughts. I agree, the distinction between positive/negative freedom is helpful. I am not sure though if I understand the point that you make about revolutions trying to exclusively promote negative freedom. Is that always the case? Is that how it should be? Here, I am not sure. Revolution is another term/phenomenon that is highly contested and delineated in very different manners. In relation to Liberalism, my intention was merely to locate the prevailing sentiment towards certain political ideals. I don’t attempt to define or understand the idea of freedom in a liberal theoretical paradigm. The intention is rather to reflect upon the concept of freedom as such – regardless if it is right or wrong, good, bad, necessary, etc. More specifically, I am trying to question why do we think of freedom as an ideal at all? Why is it so valuable? Given that my “case study” so to say, is the Syrian Revolution, the question of liberal political theory/practice is of a second degree. What I find so fascinating in the Syrian revolution is precisely the lack of agreement, consensus or a general frame in which freedom is thought and understood. I don’t know if that answers your questions or makes my intention form this taking this approach clearer. Thanks again! (The New Arrangement) – Dedicated to D. B.